With a DOL and Package program, All Risks, Ltd. has served the insurance needs of auto dealerships for over a decade. We've seen the claims. We know the loss exposures affecting auto dealerships. 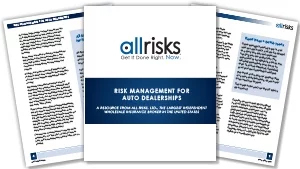 In response, we've developed a risk management resource to help dealers avoid losses and secure the best coverage at the lowest cost. Contact an All Risks Auto Dealers Specialist Today!